"Maude Drein Bryant is happily represented in all of her eight paintings. They exploit here resourcefulness as a colorist, and while still-life subjects are in the majority, her group has more variety than usual, thanks to the presence of a landscape called "Plum Blossoms" and an interior with a figure called "The Dressing Table." Mrs. Bryant paints landscape beautifully, getting the spirit of the outdoors into her canvases, filling them with sunshine and stimulating color - "Plum Trees" is an excellent example - and I believe she would profit greatly in the long run if she would do more of them. In whatever she does, the decorative element is uppermost. She has rare feeling for tone and arrangement and her style indicates very clearly that she know exactly what she is about. The best of her present offerings are "April Bouquet," "Blue and Gold" and "Vermillion, Rose and Blue." -From a Baltimore, MD newspaper. "The exhibition is rarely simulating and fine. Mrs. Bryant, especially, surprises by the great strength and character of her work. This is the more remarkable, as she has seen very little if anything, of the new movement. Yet her work is essentially and powerfully modern. She has something of the feeling of Van Gogh about her, yet she has never seen a canvas by this master. The exhibition includes the canvas which took the Alice Ball prize in Baltimore awarded by Henri, Redfield and Bellows. It is a remarkable canvas, and Mrs. Bryant should have a great future." - Philadelphia Inquirer. "The impressionistic still lifes of Maude Drein Bryant in the Folsom Galleries are excellent in color and handsome as decoration. It is one of the most attractive shows that these galleries have held this winter. Miss Bryant does not permit herself to use much fineness of detail and in one or two of her canvases she has disdained literalism so heartily that one is hard put to it to identify the flowers named in the title with the presentment of them in paint. For the most part the subjects are well chosen for the treatment allotted to them, and the Chinese bowls, lustre teapots and other accessories are handsome enough to be worthy of the flowers they are associated with." - Dec. 27, 1914, New York City. Awarded: A. Worthington Ball Prize, Baltimore, 1914; Lambert Fund Prize, Pennsylvania Academy of the Fine Arts, Philadelphia, 1914. Fellowship of the Pennsylvania Academy of the Fine Arts. Member: Charcoal Club, 1914. Association of Women Painters and Sculptors, 1916; Pennsylvania Academy of Fine Arts. Work: "Calendula and Asters, " Pennsylvania Academy of the Fine Arts; "Pompons and Doll," Fellowship PAFA, Phila. Exhibited: The Peabody Gallery c.1911-1912, The Six Baltimore Women Painters, Miss Camelia Whitehurst, Mrs. Everett Lloyd Bryant, Miss May Kremelbert, Miss Josephine G. Cochrane, Miss Marie De Ford Keller and Miss Alice Wothington Ball. Maude Drein Bryant exhibited eight canvases. Exhibited with the Philadelphia Ten. Art Institute of Chicago 1911, exhibited "Druid Lake"
The Charcoal Club, Third Exhibition of contemporary American paintings at the Peabody Institute, 1912. 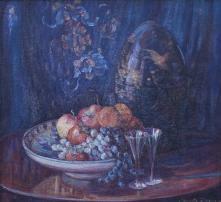 Exhibited at the Pennsylvania Academy 1912. Until Nov 14, 1912 Exhibiting at the Gimbel Bros. Art Gallery, Philadelphia. The advisory committee for the show was Hugh T. Breckenridge, Joseph T. Pearson, Jr, and Daniel Garber, faculty members of the Pennsylvania Academy of Fine Art. During December 21, 1914 - Ending December 30, 1914. One "man" Exhibited at the Folson Galleries, No. 396 Fifth Ave. "The Antique Teapot" recently won the "Alice Worthington Ball" prize in Baltimore, MD awarded by Redfield, Bellows, and Henri. March - April 1914 Maude & E.L exhibit 22 paintings at the Sketch Club, Philadelphia. 14 by E.L. and 8 by Maude. 1914 Exhibits at the Pennsylvania Academy. 1914 Pennsylvania Academy purchases "Calendulas and Asters" for their permanent collection with the Lambert Fund. (Prize) It hangs next to one of her husbands works. 1914 until April 26th. Exhibits at the MacDowell Club Gallery in NY, with ten other the Baltimore Women. Exhibited at the 11th Annual Exhibition of Selected Paintings by American Artists, City Art Museum, Saint Louis. Opening September 3, 1916. 1916 Exhibited at the Delgado Museum of Art, now the New Orleans Museum of Art. Oct. 23, 1917 She was asked to be a teacher & director of an Art League, Illinois. (The professor had been "taken off by the draft." National Academy of Design, 1923. Fine Arts of the Sesquicentennial International Exposition, Philadelphia: June 1 to December 1, 1926. Exhibited, "Vermillion, Rose and Blue" and "Perennials". The Corcoran Gallery of Art 10th Exhibition of Contemporary American Paintings that ended by May 24th, 1926.